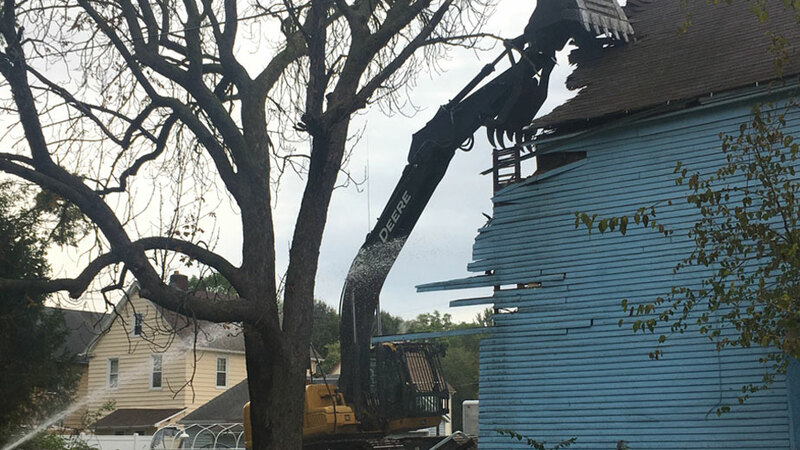 YOUNGSTOWN, Ohio – They might be small steps, but collectively they lead to improved neighborhoods and serve to enhance the quality of life within the community, officials said Thursday morning as they witnessed the demolition of a vacant house at 1514 Mahoning Ave. The demolition was the 54th such project so far this month by the Mahoning County Land Bank – a new record for a single month – Mahoning County Treasurer Dan Yemma told members of two West Side neighborhood groups and other partners gathered across the street. To date, the Land Bank has demolished about 800 dilapidated structures across Mahoning County, he said. However, the Land Bank and its community partners have made headway toward not only removing blighted structures, but also improving the lots where they once stood. While razing vacant houses is an important component to neighborhood revitalization, so too is resurrecting the abandoned property and restoring it to productive use, said Debora Flora, executive director of the Land Bank. “We don’t want to be known just for demolition,” she said. In this case, the demolition of the house came with an effort to improve the site across the street with the installation of a new bus shelter from the Western Reserve Transit Authority, a project that began at a grassroots level with two neighborhood organizations – the Garden District Neighbors and the Rocky Ridge Neighborhood District. The neighborhood groups are made up of residents of the city’s West Side. The Mahoning County Land Bank has demolished about 800 dilapidated structures in Mahoning County. John Slanina, a member of the Rocky Ridge group, said that the conversation started at a local restaurant and led to the group applying for a grant through The Raymond John Wean Foundation’s Neighborhood Success fund. The fund awarded $5,000 toward the effort, which included installing a WRTA shelter along Mahoning Avenue that fronts a newly landscaped lot across the street from the current demolition site, Slanina said. “Three buses go by this spot every hour,” he said, noting the new shelter will be decorated with a floral wrap designed by a local artist as a nod to nearby Mill Creek MetroPark Fellows Riverside Gardens. The landscaped plot was left vacant after a house was demolished there in January and the land will be transferred to Mill Creek MetroParks because of its proximity to Fellows Riverside Gardens. Flora said it was important to have the MetroParks as a landowner, which ensures that the land would remain in good condition and serve as an asset to the neighborhood. The dual projects involved cooperation between the Land Bank, Rocky Ridge and Garden District neighborhood groups, WRTA, MillCreek MetroParks and The Raymond John Wean Foundation. “This came together pretty easily,” she said. Pictured: Debora Flora, executive director of the Mahoning County Land Bank.